Located just south of the maze of trails that traverse the more prominent Penobscot and Sargent Mountains, Cedar Swamp Mountain might be the least noticed of all of the peaks in the heart of Mount Desert Island. A hike up Cedar Swamp Mountain via the Sargent South Ridge Trail makes for a great little off-the-beaten-path trek, offering great views from the exposed cliffs near the summit. This hike also gives easy access to the summits several nearby peaks as well as two beautiful carriage-road bridges, the Amphitheater Bridge and the Little Harbor Brook Bridge. The Brown Mountain Gatehouse parking area along Route 3 makes for a good starting point for this hike. Elevation Change: 720-ft elevation gain up Cedar Swamp Mountain. The trail makes a gradual ascent up the spine of Cedar Swamp Mountain, wandering through pleasantly forested scenery for 1.4 miles. 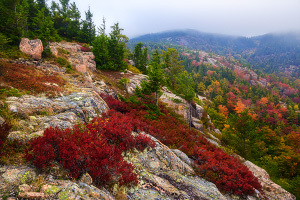 Near the summit, the scenery gets a lot more dramatic as exposed cliffs offer great open views of Penobscot Mountain to the east and the Atlantic Ocean far in the distance to the south. 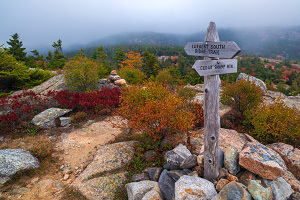 A very short spur trail off of the main Sargent South Ridge Trail leads to the actual summit marker where great views of Norumbega Mountain and Somes Sound can be seen to the west. Just past the summit, the Sargent South Ridge Trail quickly descends into the valley to arrive at the junction with the Amphitheater Trail. Continue north on the Sargent South Ridge Trail. The section just past Cedar Swamp Mountain is equally beautiful, offering majestic open views from the bare slabs of granite. The small little Sargent Mountain Pond is also a great spot. 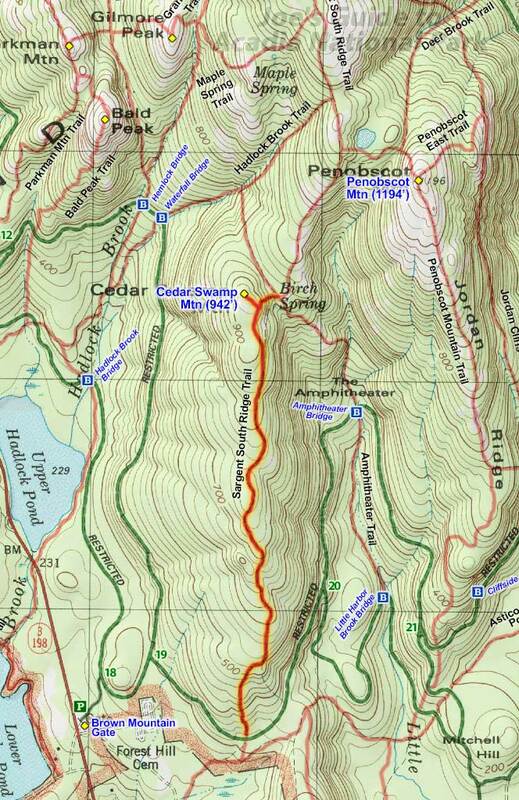 Continue to the summit of either Sargent Mountain or Penobscot Mountain. Take the rugged Amphitheater Trail southeast to descend into the forested amphitheater area surrounding Little Harbor Brook. 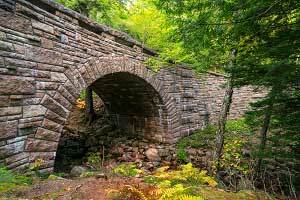 If you enjoy carriage-road bridge hunting, this trail allows you to see two. At the first carriage road junction is the majestic Amphitheater Bridge (the longest carriage road bridge, built in 1931). Continue south down the trail another .8 miles to reach the second carriage-road junction and the Little Harbor Brook Bridge (one of the smaller bridges and the second oldest, built in 1919). Hike the carriage roads west back to the Brown Mountain Gatehouse. After having tagged all of Acadia's other peaks in the area, I finally set out to hike to the summit of Cedar Swamp Mountain just so I could say I did it, but I was pleasantly surprised by all of the wonderful views along the trail near the summit area; this is a great stretch of trail! And if you have the legs, explore as many of the connected trails that you can in the area; they are all enjoyable.